I have suffered from Androgenetic Alopecia since my mid to late twenties. 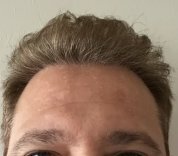 I recently found out that I am not a good candidate for a FUE hair transplant, so I have been searching the internet for other treatments to manage my hair loss. I notice that a lot of the blog articles on here are from people who have undergone hair transplants, but not much for those of us for which that is not an option. I thought I’d share my experience and what I’ve found for other people like me. In my research I’ve found there are A LOT of claims and promises out there. Some of which are clearly out there to sell you snake oils that don’t work, so be wise! I think that the best advice is usually the stuff that talks about your lifestyle as a whole, as well as genuine, results-driven products to try. It’s been a long process of learning, but there are a few interesting tips I’ve picked up on the way: The way you treat your hair is a BIG thing. I have to admit that I didn’t really care much about my hair before I started losing it. I used budget shampoos and a crappy old plastic comb that I used to rake through my hair. I’ve learnt that giving your hair a bit more care and attention is really important for keeping it. Eating the right food can also be really helpful to the health of your hair. In the past couple of years I have really cleaned up my diet and started making sure I was eating lots of protein and iron and I have to say I’ve seen a big improvement in the quality of my hair ever since. Medications can have side effects. It’s important to research them thoroughly before trying them, just to be sure of what you’re getting into. Also, hair growth supplements are basically expensive wee! I’ve looked into what’s in them and in reality, there’s nothing in there you can’t get from a good diet. If you’re getting enough of those vitamins and minerals in your food, your body won’t absorb any extra from supplements. Don’t be fooled! Avoid sulfates like the plague! They’re in a lot of (cheaper) shampoos to create the ‘lather’, and they’re also in floor cleaner, washing up liquid and engine cleaner. To think that I was applying the equivalent of engine cleaner on my hair makes me cringe now! Needless to say, they’re really terrible for hair and can impair hair growth and cause fall out. These are just a few things I’ve learnt along the way which have helped me. There is lots of stuff online, like this article which explains what exactly causes hair loss, and also this article which I found quite useful. It’s more focused on hair growth and thickening as opposed to actual hair loss, but it’s got quite a bit of advice to make your hair better. I would take the ‘natural remedies’ section with a pinch of salt as I’m not sure that stuff would actually work. I hope my advice has helped some of you! If you have any more tips please do leave them below as I would love to hear them. I am really surprised your doctor told you to use Head and Shoulders, because it’s so bad for your hair. It’s full of sulfates which can clog and damage the hair follicle, it strips the hair strand of moisture and it can cause breakage and hair loss. There are lots of better shampoo options out there. Look for shampoos that have peptides and extracts that stimulate hair growth and add thickness to existing hair. Ingredients like niacinamide, pea sprout extract and caffeine are all beneficial to hair growth too. Also, shampooing everyday is not good for hair as it can strip out the moisture. You hair just doesn’t need washing everyday - once every 2-3 days should be enough to keep hair clean without overwashing it. Hey everyone I’m wondering if there is anyone that has seen any improvement in their hair after changing their diet? I know that eating more protein, iron, fatty acids and biotin is meant to improve hair growth and thinning, so I’m wondering if anyone here has seen results from adding more of this into their food?